No more heavy lifting fans during the hot and steamy summer time! 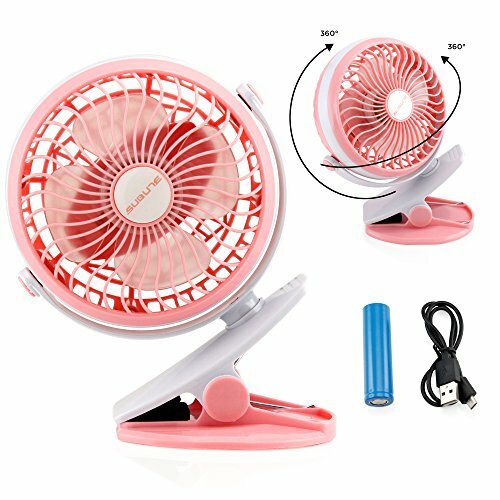 Now you can enjoy the convenience of this light weight, portable clip-on mini fan and take it anywhere with you! With the rechargeable 1850 Lithium battery, just charge it up with the USB cable, and then let the strong wind blow at you. The unique clip on design lets you clip the mini fan onto places that best suits your needs such as on desk, stroller, during camping, or even on the beach. The fan can run continuously from 2 hours to 6 hours depending on the adjustable speed, and the 360 degree rotation at different angles allows you to enjoy the cool air in many positions. Made of high quality ABS material to ensure long lasting coolness. TAKE IT ANY WHERE: Light weight, small, and portable with clip-on design. Ideal for outdoor, indoor, travel, or on the go. CONVENIENCE: Working time is 2 hr to 6 hr depending on the adjustable speed. 360 degree rotation at different angles. Easy to use with clips. SIZE & MATERIAL: Item approx. 19H x 15W x 9.5D cm. Packaging approx. 20H x 15W x 10D cm. Made of high quality ABS material. Product of Oct17 Trademark Registered.